I was at our local grocery store’s produce section yesterday and saw their display of fresh locally grown vegetables. They looked so fresh and delicious that I grabbed a bunch. 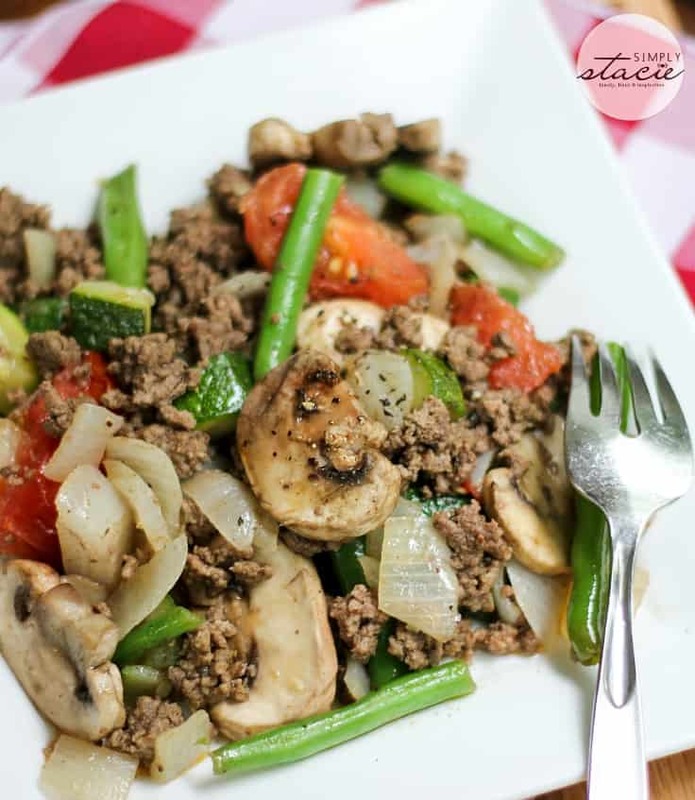 Today I whipped up this simple and quick meal with all the fresh veggies and some ground beef and all in one pan so less mess to clean. The veggies made the dish so vibrant and it tasted so good! And it’s low carb! Want more low carb recipes? Try my Buffalo Popcorn and Cheese Chips. 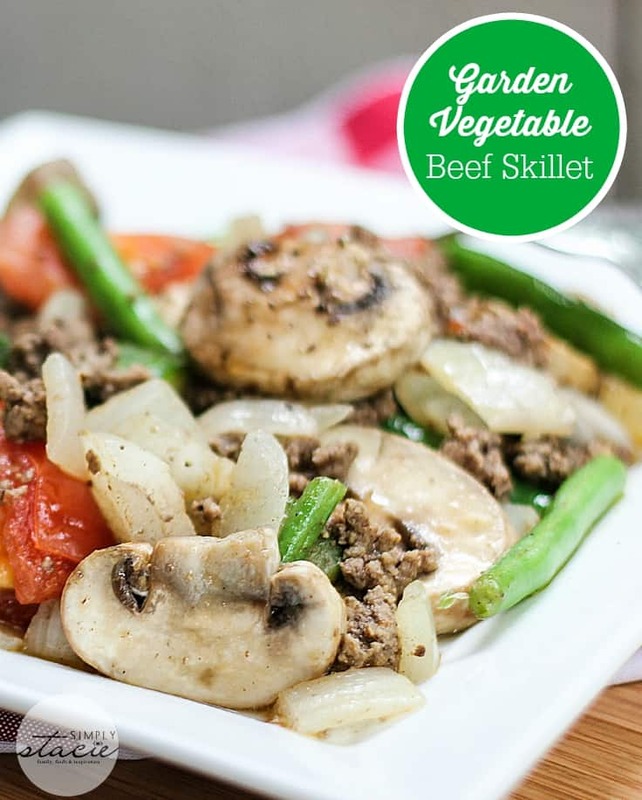 A one pan meal made with fresh veggies, spices and ground beef! Cook ground beef and onion in a skillet over medium heat until beef is no longer pink. Mix in vegetables, oregano and salt & pepper. Continue to cook over medium heat for about 10 minutes. looks and sounds yummy!!!! may try this week! thanks for the recipe!!!! I am definitely going to try this recipe. It looks delicious. Thanks for sharing!! This is a simple recipe that I will be trying for my family. Wow! This is really a treat. Yum! Thanks a lot for the share. I’m glad I found this recipe, it looks and sounds so yummy! I love vegetable out of the garden and always trying to find different recipes to fix. I copied down the recipe and guess what I’m going to fix for supper! YUM!!! I can’t wait to make this! I pinned for future reference. Yummy! Thanks so much for the great recipe!! I’m always looking for simple, filling, and delicious ideas for dinner. This dish looks great, I’d love to try it! Yummy!! This looks so wonderful! I’m all for low carb, too, I’m diabetic. Thanks for the awesome recipe! TOO BAD WE DONT FAVE SMELLAVISION,BUT I CAN TASTE IT NOW…………………. This looks delicious, healthy and easy to prepare! A great way to use fresh veggies. Looks and sounds delicious! Thank you for the recipe! My family is on the Paleo Diet and I am always trying to find new recipe ideas that don’t include bread, pasta, dairy, etc. This recipe will definitely be going into my recipe box!! Guess what we’re having for dinner tonight! I would so eat this! Love all the fresh veggies I will have to try this! Looks delicious! Protein & Vegetables all in one, count me in! 🙂 Thanks for posting! Oh my! why didn’t I think of this! LOL I pinned this…. will be trying it soon! The green beans look ah-mazing! 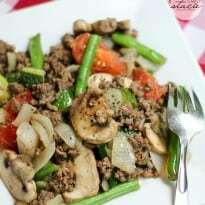 Pingback: Here are 34 Ground Beef Recipes You Will Want To Try! We have a large garden this year with lots of fresh veggies. I have been for ways to get creative with them and this recipe is perfect! This was good, healthy and easy, thanks! Very good and tasy!!! Just had it for dinner and my 3 year old ate it all and my husband second it!!! Thanks for the recipe!! Yay! I’m happy to hear that. I am a vegetarian and using beefless crumbles instead of beef and it was delicious. Great recipe! I am a vegetarian and swapped the beef with beefless crumbles. It was delish. Great recipe! If you find it overly greasy, you can drain it.